Last year for a bit of a treat, I took Mum and Dad for brunch at Skygarden. Skygarden sort of does what it says on the tin: it's a garden in the sky. Or more specifically, a garden inside the top of a skyscraper, with several restaurants chucked in for good measure so you can dine with the ultimate view. And with a three course brunch complete with glass of fizz, we were pretty much guaranteed to have a lovely time. 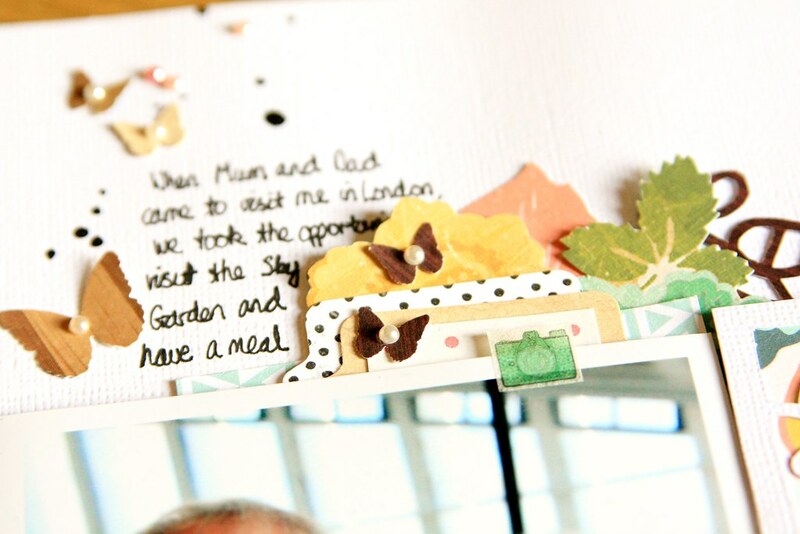 I had lots of photos to scrapbook from this experience: loads of the views and the plants in the garden, and so I decided to select one photo for a 12x12 page and include the rest in a divided page protector. 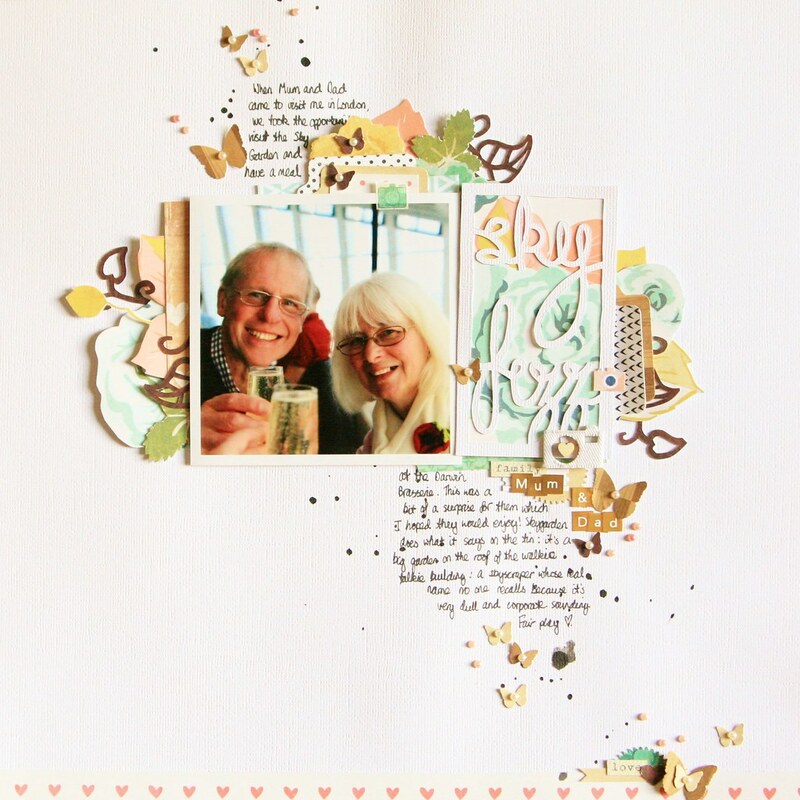 I wanted to a picture involving my parents to be the main focus, but I looked at the whole range of photos when choosing supplies for this page. 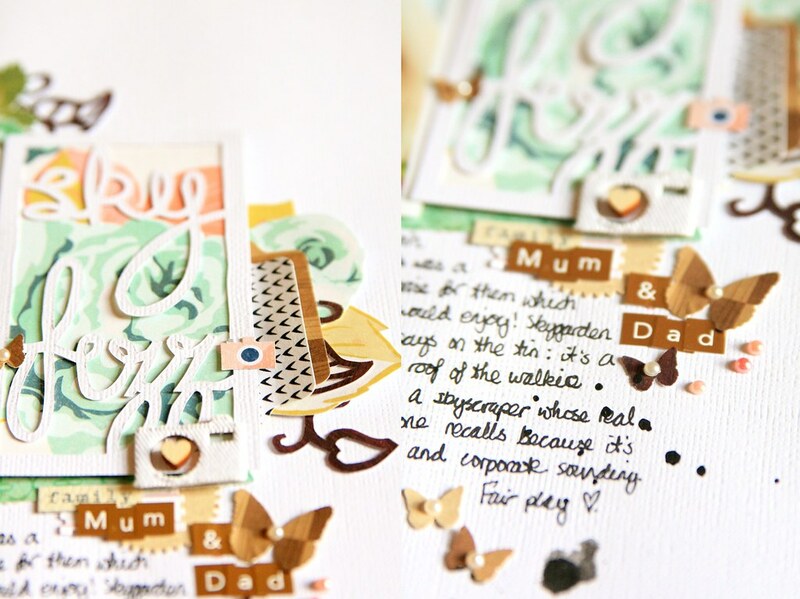 I opted for greens and browns to match the city views and greenery, but also pulled out some paper in warmer, autumnal tones. For my title, I designed the words inside a frame and cut them out with a craft knife. I like the look of a white title on a white background, but the frame design also gave me the opportunity to showcase a lovely patterned floral paper behind it. The white border also provided a nice design link to the photo. 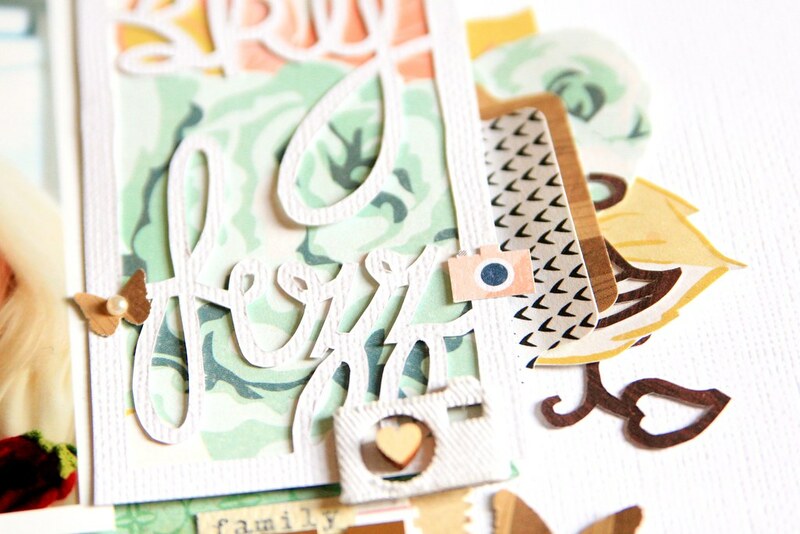 I added layers of patterned paper around the central block of title and photo. I also framed the design with the first bit of journaling (the rest of the story going into the divided page protector). 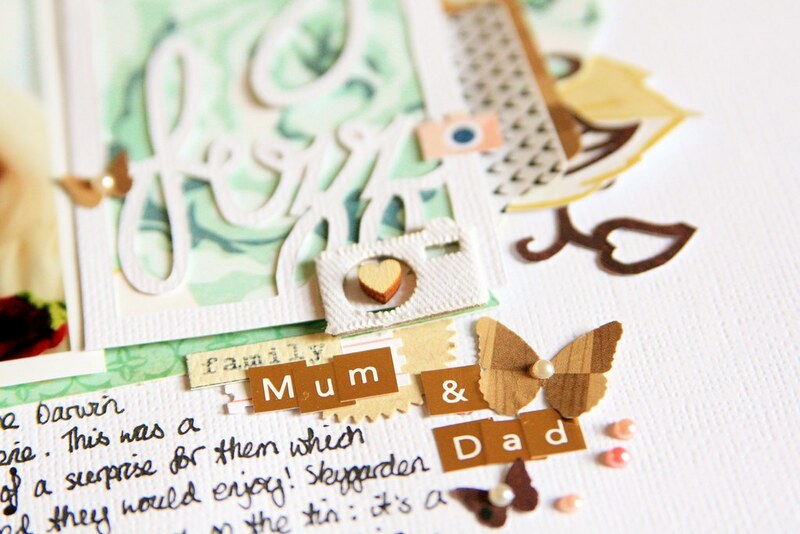 To create the layers, I used punches - the tab being a favourite - and fussy cut flowers from patterned paper. I also drew out and cut some little leaf designs, putting my craft knife to good use and creating another layer of detail; cutting out the centres of the leaves allowed more of the other layers to show through. 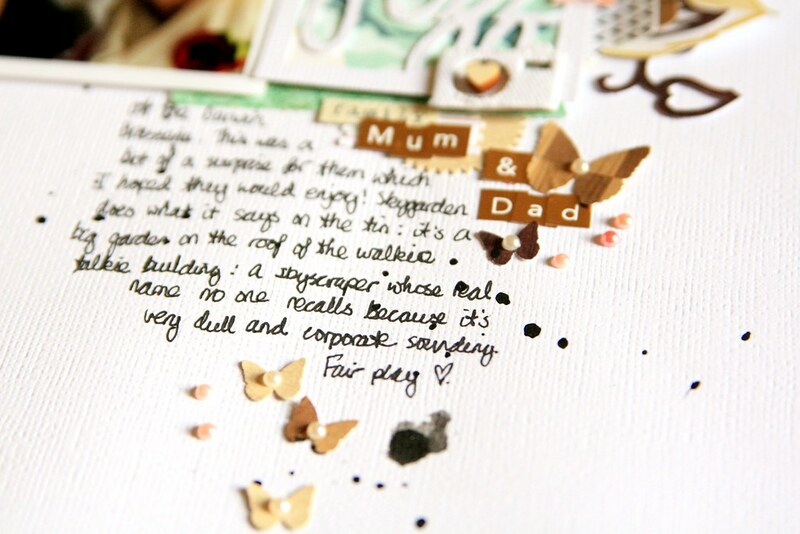 I finished off the page with a few details: ink splatters to go with the journalling, punched butterflies topped with little pearls and or course a camera here and there. I'm pretty pleased with the final page and I'll aim to share the matching pocket page soon! P.S. 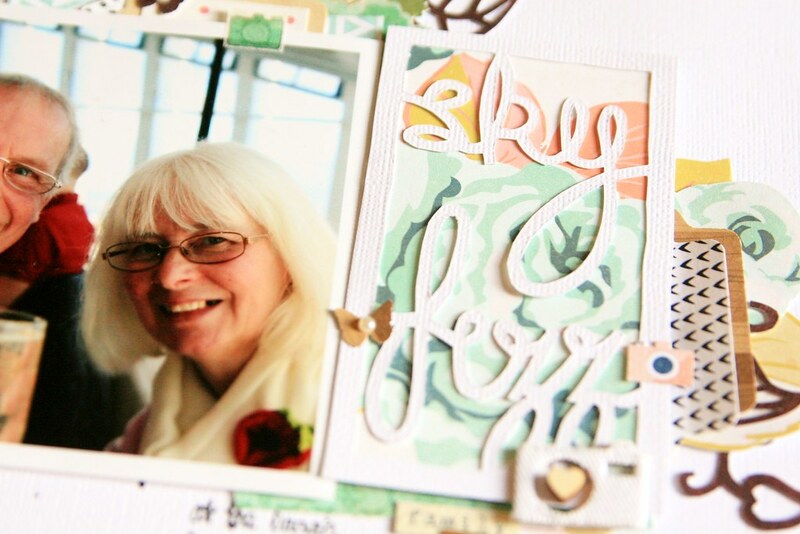 I made this page on the fabulous Bloggers' Weekend where I had the most brilliant time: it felt like such a luxury to truly relax and think only about scrapbooking, nattering to fellow crafters and, of course, eating! You are the Queen of the Craft Knife, undoubtedly! They need you in the Art Department :). I love all your little details, especially around that word frame and the cut-put effect of the leaves echoing it. Pretty perfect, and perfectly pretty. I agree with Alexa - truly the queen of the craft knife! This really is such a pretty layout. And yes, the weekend was so much fun - gal dyou for your hash browns for breakfast! I'm another in awe of your craft knife handling ability! It's a gorgeous looking page.